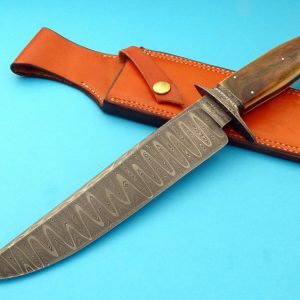 The Bowie knife blades can reach up to 14″ in over all length; however, the sweet spot for a Bowie blade length is 9 – 11.” Jim Bowie’s knife had a 9.25″ blade. The majority of custom forged blades are flat ground. Simply put, this means the blade tapers all the way from the spine to the edge from both sides. Doing so makes this a more difficult grind as the maker has to remove a lot of metal. The advantage gained is a lighter blade that maintains its integrity. Another technique utilized with forged blades is differential heat treatment. Basically, this creates a harder edge and a softer spine. The forged blade will generally have a temper line showing the difference between the harder and softer parts of the blade. The carbon steels that are used are too numerous to mention them all here. 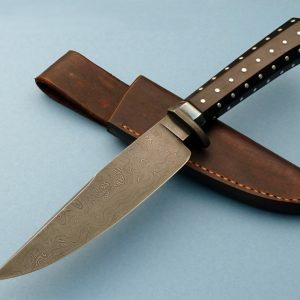 The primary ones used with forged Bowie blades are; 0-1, W-2, 1075, 1084, 1095, 5160 and 52100. There are three basic types of handles. First, the hidden tang; which is exactly what it sounds like. A hole is drilled and shaped through the center of the handle material to make room for the tang. Epoxy is often used as the adhesive to keep the tang and handle material together. Depending on the material and maker, the handle may or may not have a pin through the handle. 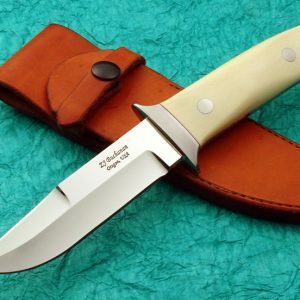 This type of knife handle will also lend itself to the take down handle. The handle is built in a similar fashion, but to a higher degree of fit as no glue is used to secure the tang and handle material. The handle is held together with a type of nut or finial that screws onto the tang providing the necessary pressure to keep the handle secured. Generally, a tool is provided to remove the device that is holding the knife together. Second is the mortise tang. 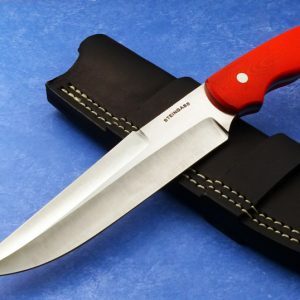 The tang will be shorter and the handle material will be spit. The inside of the handle material will have a slot cut evenly on both sides. This will allow the tang to be sandwiched in between both pieces of handle material. This technique will almost always have a combination of epoxy and some type of pin through the handle. An advantage of this type of handle is the reduction of weight. 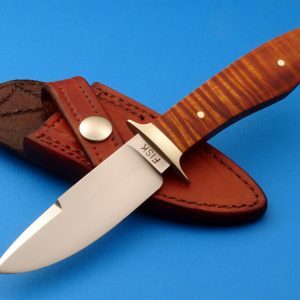 This can really help with a hunter/skinner, as well as, aid in the balance of the knife. Third is the frame handle. Basically, the tang is slotted into a frame and handle material is added to each side. When completed it gives the illusion that the knife has a full tang. Generally, constructed with both hidden and pins that show. This is the most complex method of the three. Expect to pay more for this type of handle. 1) Steel: Basically, stainless steel is used as opposed to carbon steel. 2) Handle: Generally, either a full tang or hidden tang construction.